I finally made a visit to Le Fournil French Bakery. The bakery has been in the Eastlake neighborhood by the University Bridge since 1997. The owner, who is originally from France, wanted to bring the French bakery experience to Seattle. I ordered a chocolate/orange tart with a vanilla latte. 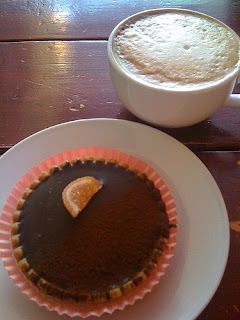 The tart was ridiculously good! It was very rich, and had just a hint of orange flavor. Half of the tart was dusted with cocoa powder. The latte was pretty good on i﻿ts own. I love French bread, so I also purchased a loaf to take home. The bread was very tasty. Le Fournil offers a full menu of sandwiches, quiche, salads and soups. Not to mention, their dessert case is full of delicious looking pastries that changes seasonally. 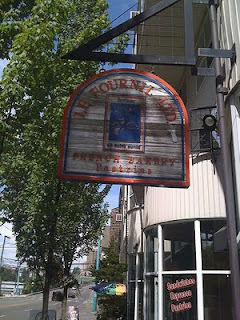 I highly recommend visiting Le Fournil for all that they have to offer! I stopped in here a couple of times and it was amazingly good...Glad to see your post... LOVE your blog and always check you out!